Recently I had an in depth tour on HM2 of our magnificent Port in Thunder Bay with Tim Heney, CEO Port of Thunder Bay . 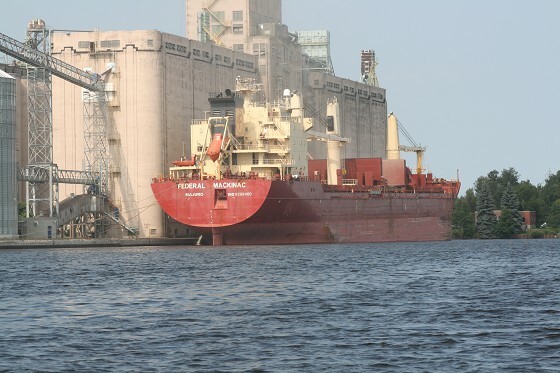 We first saw the Manitoba, a small laker loading at Richardson’s Elevator. It was once a Paterson Ship originally launched as the Manidoc in 1966. It was built in Collingwood and capable of holding 19,000 tons at 26.5 feet and loading at 1200 tons per hour. We also saw a larger ship from FedNav; a company owned by the Pathe family of Montreal. This ship can hold 35,000 tones. “ The larger ocean going ships can’t be loaded to full capacity in the seaway but will take on 23,000 tons here and then top up in Quebec. This ship will go right to Europe. We work with 75 of these types of ocean ships and a total of 400 ships per year.,” said Tim Heney. A big change at the Port is with the Wheat Board, that was a system where they would call the wheat in to sell. Now the farmers sell the wheat themselves during times of higher prices. “ We expect to see more activity in the fall and a large crop,” said Heney. The Port also haven’t had a lot of crane usage this year. There was one wind mill shipment so far this year versus 12 last year but they expect more oil sands shipments. The Port has 550,00 square feet of storage building space and 8 miles of track so has lots of capacity and capability. They have a direct staff of 6 and are a small organization but in the terminal as a whole about 90 people work full time.